Biodiversity may refer to the diversity of genes, species or ecosystems in general. These varying concepts of biodiversity occasionally lead to conflicts among researchers and policy makers, as each of them require a customized type of protection strategy. This book addresses the questions surrounding the merits of conserving an existing situation, evolutionary development or the intentional substitution of one genome, species or ecosystem for another. Any practical steps towards the protection of biodiversity demand a definition of that which is to be protected and, in turn, the motivations for protecting biodiversity. Is biodiversity a necessary model which is also useful, or does it carry intrinsic value? Debates like this are particularly complex when interested parties address it from different conceptual and moral perspectives. Comprised of three parts, each complemented by a short introductory paragraph, this collection presents a variety of approaches to this challenge. The chapters cover the perspectives of environmental scientists with expertise in evolutionary, environmental biology, systematic zoology and botany, as well as those of researchers with expertise in philosophy, ethics, politics, law and economics. This combination facilitates a truly interdisciplinary debate by highlighting hitherto unacknowledged implications that inform current academic and political debates on biodiversity and its protection. The book should be of interest to students and researchers of environment studies, biodiversity, environmental philosophy, ethics and management. Part 1 Concepts and Values 1. The Necessity for Biodiversity Research: We are Responsible for the Quality of Life of Coming Generations 2. Biodiversity and the "Substitution Problem" 3. Biodiversity: A Methodological Reconstruction of Some Fundamental Misperception 4. Framing Biodiversity: The Case of "Invasive Alien Species" 5. 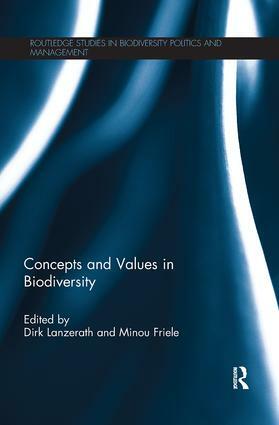 Community-Level Biodiversity: An Inquiry into the Ecological and Cultural Background and Practical Consequences of Opposing Concepts 6.Ethics of Nature and Biodiversity 7. The Values of Biodiversity Part 2 Policies and Justice 8. The Future of Biodiversity and Sustainable Development: Challenges and Opportunities 9. Access and Benefit Sharing as a Challenge for International Law 10. The Legal Protection of Biodiversity in Namibia 11. The Impact of Access and Benefit Sharing Programmes on Indigenous People in Australia 12. Reconstructing the "Biopiracy" Debate from a Justice Perspective Part 3 Challenges and Chances 13. Biodiversity Hotspots: Concepts, Applications and Challenges 14. Whose Biodiversity is it? Challenges in Managing Migratory Species 15. Facing the Biodiversity Challenge: Plant Endemism as an Appropriate Biodiversity Indicator 16. Bionics 17. Nature’s Chemical Treasure Trove: Biodiversity and Pharmaceuticals 18. Protection of Biodiversity for the Sake of Science? Dirk Lanzerath is Executive Officer of the German Reference Centre for Ethics in the Life Sciences (DRZE) and Lecturer for Philosophy and Ethics at the University of Bonn, Germany. Minou Friele is Head of the Junior Research Group Medicine and Ethics at the Institute for Science and Ethics (IWE) at the University of Bonn, Germany.